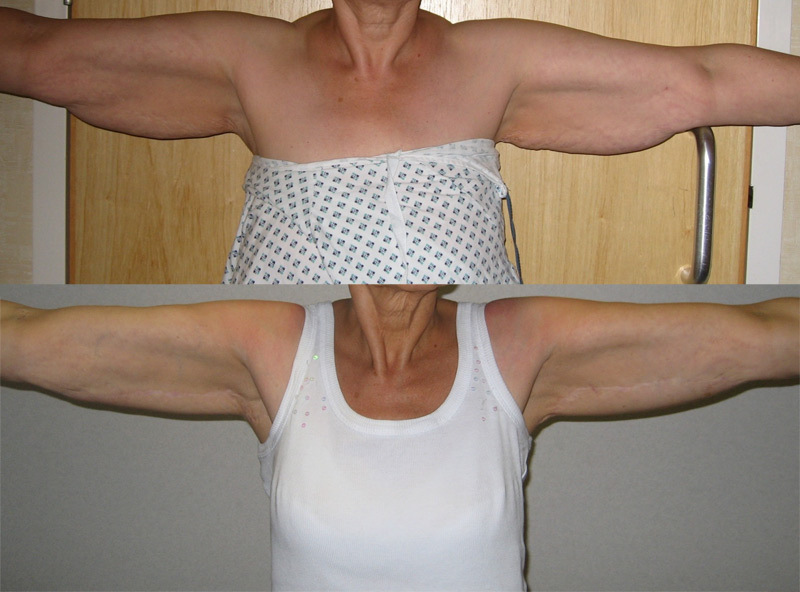 Why Choose To Have Upper Arm Tightening? 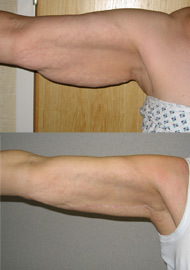 This treats loose skin and droop in the upper arms, which can be a result of weight loss, age or following liposuction. The loose skin in the upper arm is removed leaving the scar hidden in the armpit and frequently along the inner aspect of the arm to the elbow. The length of the scar will depend on the degree of skin excess. This operation is very predictable at changing the shape of the arm. It will leave an obvious scar that will take about 12 months to fade. The incision is usually in an L-shape from the armpit and then along the inner arm, but can also be just in the armpit. They will initially appear a little pink in the first few weeks, but will then fade to white. Most patients will form extremely good quality scars over time. The length of time will vary in each individual patient. A full medical history will be obtained before any surgery. As a precaution, do not take any over the counter medicines or herbal remedies prior to surgery or for 3 days following. Also avoid aspirin, ibuprofen and Voltarol based tablets. It would be useful to bring a list of any prescribed medications to your pre-op assessment. If you are a smoker, try and stop for six weeks before and one week after surgery as it can reduce the chances of complications. The operation takes 2 - 2.30 hours depending on the areas to be treated. This can be done under local anaesthetic though it is usually by general-anaesthetic. Usually a one night stay. The area will usually be covered by a medical glue that acts as a dressing (or simple steri-strip dressings). This is in place for about two weeks by which time all wounds are usually healed. You will need to wear the pressure garment day and night for the first week, and then during the day for a further 2-3 weeks. Day 1 You should be taking it very easy! Relax in the hospital or at home. Day 2-5 You can be up and about but you may be in some discomfort. Day 5-14 Most of the swelling and bruising will settle over this next week. You will be feeling much better from here onwards. You can start exercising gently and build it up over the next 10 days. Week 4 onwards you will be nearly back to normal. We will check your wound at day 5 and again the following week. You will then have an appointment with Stephen McCulley at 3 months. You will not be charged for any follow up appointment relating to your surgery. Although most of your result will be noticeable immediately it will continue to improve over the first three months. People vary in recovery and this will depend on the size of area treated, but allow 10-14 days. Most patients are very comfortable at one week and feel more stiff than in pain. Patients usually feel able to walk a distance at 3 days and swim gently by 3 weeks. Strenuous exercise (aerobics etc) should be avoided for 6 weeks, and contact sports for 8 weeks. Patients should avoid driving until they are completely free of pain and restriction, and be able to confidently perform an emergency stop. This is to ensure they will be covered by their insurance policy. It may take up to 3 weeks to recover sufficiently. This is a routine operation that is a great success for the vast majority of patients. However, as with any procedure, it is very important you understand what can go wrong as well as right. The potential complications are listed below. Small degrees of asymmetry: The same operation will be performed on both sides. However effects of surgery can be subtlety different on the two sides. Scars: The quality of scars vary between patients as they may stretch differently. Skin irregularity: Small areas of irregularity can be observed. Altered sensation: Some altered sensation can be noticed but usually settles over the first few weeks. Bruising/bleeding: Usually minor but can be greater occasionally. General operation risks: Chest infections, Blood clots in the leg or lung (DVT or PE). Although rare it is important to avoid these by not smoking, being excessively overweight and moving about after surgery as soon as possible. If you experience any side-effects that you are concerned about please don't hesitate to contact us. 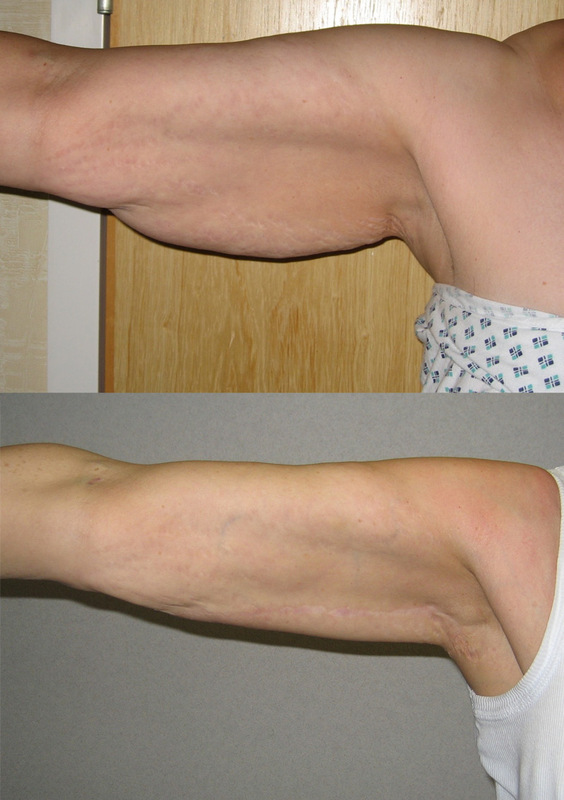 What does Upper Arm Tightening (Brachioplasty) cost? *Some prices shown are in a range reflecting slight differences in prices or pre-surgery investigations between the two hospitals. If you'd like to see more then please view our frequently asked questions on Cosmetic Body Procedures!